BATTER: WATER ENRICHED FLOUR (WHEAT FLOUR, NIACIN, IRON, THIAMINE MONONITRATE, RIBOFLAVIN, FOLIC ACID), SUGAR, DEGERMED YELLOW CORN MEAL, SALT, LEAVENING (SODIUM ACID PYROPHOSPHATE, SODIUM BICARBONATE), SOY FLOUR, SOYBEAN OIL DRIED HONEY, ONION POWDER, SOY LECITHIN, NONFAT MILK, EGG COOKED IN VEGETABLE OIL (CONTAINS ONE OR MORE OF: CORN OIL COTTONSEED OIL, SOYBEAN OIL). CHICKEN FRANK: MECHANICALLY SEPARATED CHICKEN, WATER, DEXTROSE, SALT, CONTAINS 2% OR LESS OF: CORN SYRUP, FLAVORINGS, SODIUM PHOSPHATE, PAPRIKA AND PARIKA OLEORESIN, SODIUM ERYTHORBATE, SODIUM NITRITE. PREDUST: ENRICHED WHEAT FLOUR (ENRICHED WITH NIACIN, REDUCED IRON, THIAMINE MONONITRATE, RIBOFLAVIN, FOLIC ACID), WHEAT FLOUR, WHEY POWDER, SALT. Batter ingredients: water, enriched flour (wheat flour, niacin, iron, thiamin mononitrate, riboflavin, folic acid), sugar, degermed yellow corn meal, salt, leavening (sodium acid pyrophosphate, sodium bicarbonate), soy flour, soybean oil, dried honey, onion powder, nonfat milk, egg, cooked in vegetable oil (contains one or more of: corn oil, cottonseed oil, soybean oil), frank ingredients: mechanically separated chicken, water, pork, corn syrup, beef, modified food starch, contains 2% or less of salt, potassium lactate, flavorings, sodium phosphate, lemon dextrose (dextrose, citric acid, lemon oil), paprika, sodium diacetate, hydrolyzed soy protein, sodium erythorbate, sodium nitrite, extractive of paprika. BATTER: WATER, ENRICHED FLOUR (WHEAT FLOUR, NIACIN, IRON, THIAMINE MONONITRATE, RIBOFLAVIN, FOLIC ACID), SUGAR, DEGERMED YELLOW CORN MEAL, SALT, LEAVENING (SODIUM ACID PYROPHOSPHATE, SODIUM BICARBONATE), SOY FLOUR, SOYBEAN OIL, DRIED HONEY, ONION POWDER, SOY LECITHIN, NONFAT MILK, EGG, COOKED IN VEGETABLE OIL (CONTAINS ONE OR MORE OF: CORN OIL, COTTONSEED OIL, SOYBEAN OIL). 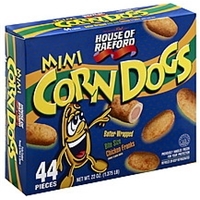 FRANK INGREDIENTS: MECHANICALLY SEPARATED CHICKEN, PORK, WATER, DEXTROSE, CORN SYRUP, SALT, FLAVORINGS, SODIUM PHOSPHATE, BEEF, PAPRIKA AND PAPRIKA OLEORESIN, SODIUM ERYTHORBATE, SODIUM NITRITE. 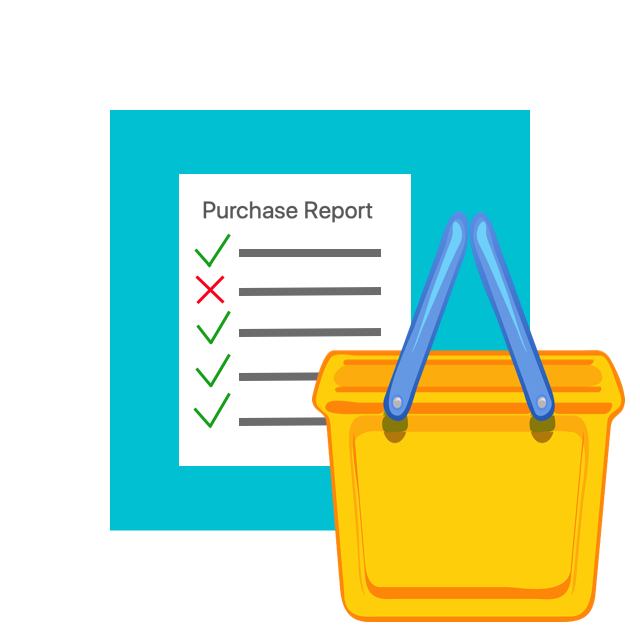 Batter mix (enriched flour (wheat flour, niacin, iron, thiamine mononitrate, riboflavin, folic acid), enriched corn meal (corn meal, niacin, iron, thiamine, iron, thiamine mononitrate, riboflavin, folic acid), sugar, salt, leavening (sodium acid pyrophosphate, corn starch, sodium bicarbonate), honey solids (honey, high fructose corn syrup, wheat starch, corn syrup, soy flour, calcium stearate, soy lecithin), modified corn starch, onion powder and water. Frankfurter: mechanically separated chicken, pork, water, dextrose, salt, corn syrup, flavorings, sodium phosphate, beef, sodium erythorbate, paprika, oleoresin of paprika, sodium nitrite.contains wheat, soy. Batter ingredients: water, enriched flour (wheat flour, niacin, iron, thiamine mononitrate, riboflavin, folic acid), sugar, degermed yellow corn meal, salt, leavening (sodium acid pyrophosphate, sodium bicarbonate), soy flour, soybean oil, dried honey, onion powder, nonfat milk, egg. 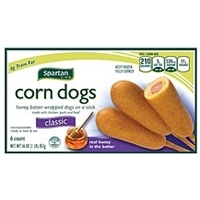 Cooked in vegetable oil (contains one or more of: corn oil, cottonseed oil, soybean oil). Frank ingredients: mechanically separated chicken, water, pork, corn syrup, beef, modified food starch, contains 2% or less of salt, potassium lactate, flavorings, sodium phosphate, lemon dextrose (dextrose, citric acid, lemon oil), paprika, sodium diacetate, hydrolyzed soy protein, sodium erythorbate, sodium nitrite, extractive of paprika.contains: soy, wheat, eggs, milk. Batter: water, enriched flour (wheat flour, niacin, iron, thiamin mononitrate, riboflavin, folic acid), sugar, degermed yellow corn meal, salt, leavening (sodium acid pyrophosphate, sodium bicarbonate), soy flour, soybean oil, dried honey, onion powder, nonfat milk, egg, cooked in vegetable oil (contains one or more of: corn oil, cottonseed oil, soybean oil). 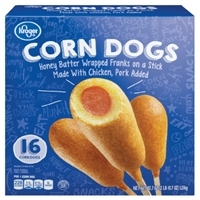 Frank: mechanically separated chicken, water, pork, corn syrup, beef, modified food starch, contains 2% or less of: salt, potassium lactate, flavorings, sodium phosphate, lemon dextrose (dextrose, citric acid, lemon oil), paprika, sodium diacetate, hydrolyzed soy protein, sodium erythorbate, sodium nitrite, extractive of paprika.contains: soy, wheat, eggs, milk. 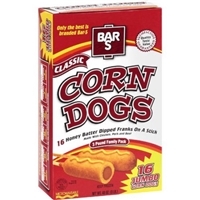 Brand/Manufacturer: Bar-S Bar S Foods Co.
Batter ingredients: water, enriched wheat flour (flour, niacin, reduced iron, thiamine mononitrate, riboflavin, folic acid), sugar, enriched degermed yellow corn meal (yellow corn meal, niacin, reduced iron, thiamine mononitrate, riboflavin, folic acid), yellow corn flour, soy flour, contains 2% or less of the following: leavening (sodium acid pyrophosphate, sodium bicarbonate), salt, soybean oil, egg yolk, potato flour, whey, dried honey, modified corn starch, wheat starch, dextrose, natural and artificial flavor. Frankfurter ingredients: mechanically separated chicken, water, pork, dextrose, modified corn starch, salt, contains 2% or less of the following: beef, corn syrup, flavorings, sodium phosphates, potassium lactate, potassium acetate, sodium diacetate, sodium erythorbate, oleoresin of paprika, sodium nitrite, smoke flavoring. Fried in vegetable oil.contains wheat, soy, egg and milk. Child safety tip: for kids under 5, remove stick, cut lengthwise, then slice into small bite-sized pieces. 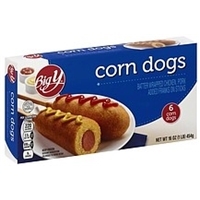 Batter: water, enriched flour (flour, niacin, reduced iron, thiamine mononitrate, riboflavin, folic acid), sugar, enriched degermed yellow corn meal (yellow corn meal, niacin, reduced iron, thiamine mononitrate, riboflavin, folic acid), yellow corn flour, soy flour, contains 2% or less of the following: leavening (sodium acid pyrophosphate, sodium bicarbonate), salt, soybean oil, egg yolk, potato flour, whey, dried honey, modified corn starch, wheat starch, dextrose, natural and artificial flavor. 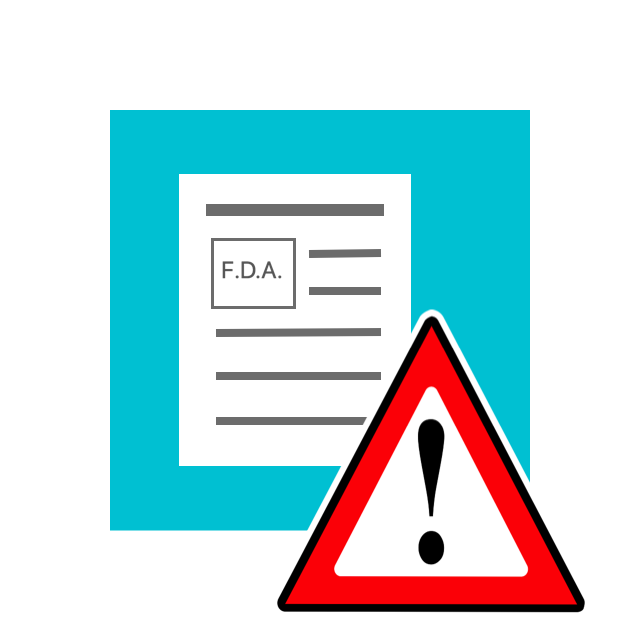 Frankfurter: beef, water, corn syrup, salt, contains 2% or less of the following: potassium lactate, sodium diacetate, flavorings, sodium phosphates, sodium erythorbate, sodium nitrite. Fried in vegetable oil.batter: contains wheat, soy, egg and milk. Child safety tip: for kids under 5, remove stick, cut lengthwise, then slice into small bite-sized pieces. 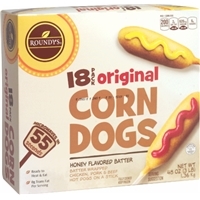 Batter: water, enriched flour (flour, niacin, reduced iron, thiamine mononitrate, riboflavin, folic acid), sugar, enriched degermed yellow corn meal (yellow corn meal, niacin, reduced iron, thiamine mononitrate, riboflavin, folic acid), yellow corn flour, soy flour, contains 2% or less of the following: leavening (sodium acid pyrophosphate, sodium bicarbonate), salt, soybean oil, egg yolk, potato flour, whey, dried honey, modified corn starch, wheat starch, dextrose, natural and artificial flavor. Frankfurter: mechanically separated chicken, water, pork, pasteurized process cheddar cheese (cheddar cheese (cultured pasteurized milk, salt, enzymes), water, cream, sodium phosphate, salt, sorbic acid (as a preservative), artificial coloring), modified corn starch, dextrose, salt, beef, contains 2% or less of the following: corn syrup, flavorings, sodium phosphates, potassium lactate, sodium diacetate, sodium erythorbate, oleoresin of paprika, sodium nitrite. Fried in vegetable oil.batter: contains wheat, soy, egg and milk. 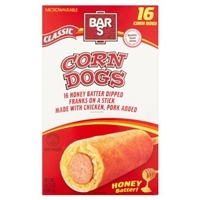 Batter: water, enriched flour (flour, niacin, reduced iron, thiamine mononitrate, riboflavin, folic acid), sugar, enriched degermed yellow corn meal (yellow corn meal, niacin, reduced iron, thiamine mononitrate, riboflavin, folic acid), yellow corn flour, soy flour, contains 2% or less of the following: leavening (sodium acid pyrophosphate, sodium bicarbonate), salt, soybean oil, egg yolk, potato flour, whey, dried honey, modified corn starch, wheat starch, dextrose, natural and artificial flavor. 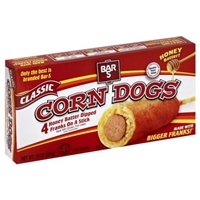 Frankfurter: mechanically separated chicken, water, pork, modified corn starch, dextrose, salt, beef, contains 2% or less of the following: corn syrup, flavorings, sodium phosphates, potassium lactate, sodium diacetate, sodium erythorbate, oleoresin of paprika, sodium nitrite. Fried in vegetable oil.batter: contains wheat, soy, egg and milk. Child safety tip: for kids under 5, remove stick, cut lengthwise, then slice into small bite-sized pieces. Batter ingredients: water, enriched flour (wheat flour, niacin, iron, thiamine mononitrate, riboflavin, folic acid), sugar, degermed yellow corn meal, salt, leavening (sodium acid pyrophosphate sodium bicarbonate), soy flour, soybean oil, dried honey, onion powder, soy lecithin, nonfat milk, egg. 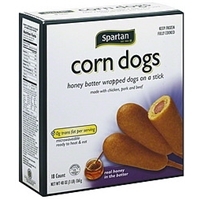 Cooked in vegetable oil (contains one or more of: corn oil, cottonseed oil, soybean oil). 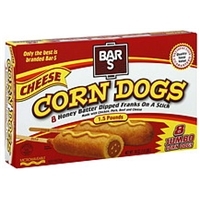 Frank ingredients: mechanically separated chicken, pork, water, dextrose, salt, corn syrup. 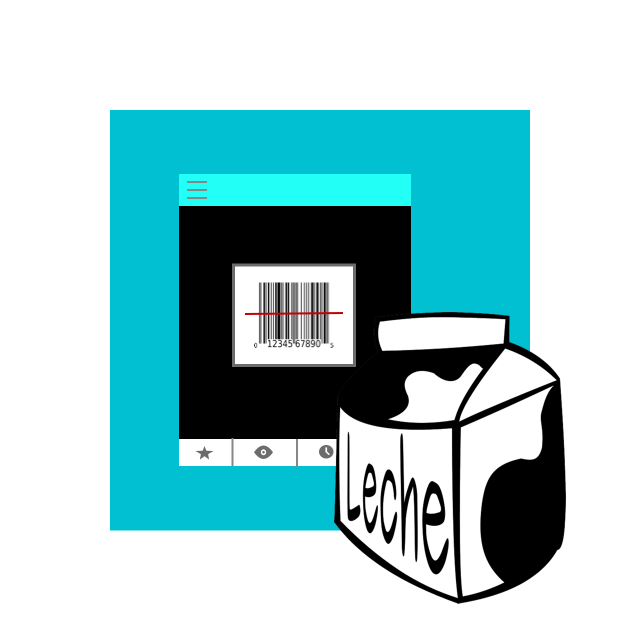 Contains 2% or less of flavorings, sodium phosphate, beef, paprika and paprika oleoresin, sodium erythorbate, sodium nitritecontains: wheat, soy, milk, egg. 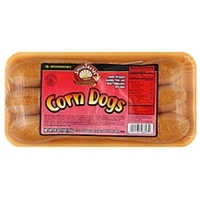 Chicken frank ingredients: mechanically separated chicken, water, salt, corn syrups solids, flavorings, dextrose, ascorbic acid (vitamin c), garlic powder, natural smoke flavoring, extractives of paprika, sodium nitrite. 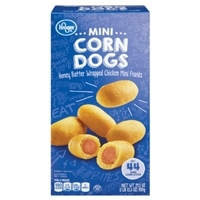 Battered and breaded with: water, enriched wheat flour (enriched with niacin, reduced iron, thiamine mononitrate, riboflavin, folic acid), enriched corn meal and corn flour (both enriched with niacin, reduced iron, thiamine mononitrate, riboflavin, folic acid), sugar, soy flour, leavening (sodium acid pyrophosphate, sodium bicarbonate), salt, modified corn starch, dextrose, egg yolks, nonfat milk, sodium caseinate. 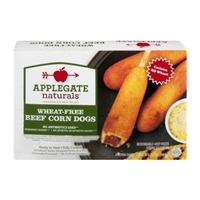 Brand/Manufacturer: Applegate Applegate Farms, LLC. 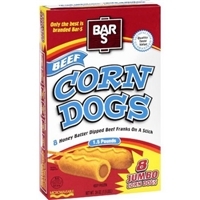 Hot Dog: Beef***, Water. Contains less than 2% of the following: Sea Salt, Celery Powder, Onion Powder, Spices, Paprika. Wheat-Free Batter: Batter Mix [Degermed Yellow Corn Meal, Sugar, Yellow Corn Flour, Rice Flour, Egg Whites, Soy Flour, Egg Yolk, Pregelatinized Yellow Corn Flour, Soybean Oil, Salt, Leavening (Sodium Acid Pyrophosphate, Sodium Bicarbonate)], and Water. Brand/Manufacturer: Applegate Farms Applegate Farms, LLC. Uncured hog dog: beef (beef never administered antibiotics, added hormones or animal by-products. Vegetarian grain-fed diet), water. Contains less than 2% of the following: sea salt, paprika, dehydrated onion, spices, nutmeg oil, celery powder. 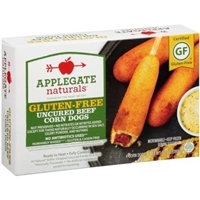 Gluten-free batter: yellow corn flour, sugar, yellow corn meal, tapioca starch, rice flour, egg whites, soy flour, sunflower oil, leavening (sodium acid pyrophosphate, sodium bicarbonate), egg yolks, salt, xanthan gum, vanilla flavor (dextrose, natural flavors (including vanilla extract), corn starch). Gluten free.contains: eggs and soy.